The name of Major General Muhammadu Buhari (rtd) seems to be trending in Nigeria currently. He has been rated above his counterpart President Goodluck Ebele Jonathan by several media outlets both home and abroad. It is very glaring that he stands a chance of being the next Nigerian president come March, 2015. Sincerely, he is someone I admire so much, he talks with so much passion, he has a record of uprightness and transparency and maybe the iron hand which may serve as the antidote to the problem of corruption by public office holders which has failed to go away in Nigeria. Against these good sides needed for the general good of the country, personally it has been very difficult for me to ever forget the ordeal Buhari caused me and my fellow corpers in Bauchi state, in the year 2011. Kindly sit back, get a chair and maybe a drink to share of this hurting story I hate to remember. I will try to make this as brief as possible. I was posted to Bauchi state for my National Youth Service Corps programme in October, 2010. During this period, the Federal Government mandated youth corpers to work for the Independent National Electoral Commission (INEC). We were told it was compulsory which till date I can’t confirm the validity of that claim. Most corpers were reluctant at first but not so long we all joined the INEC train as adhoc members of staff. Everything went smoothly from the training level down to the registration of voters, we all experienced minor challenges that were well managed. I was posted to a distant village called Tibbako in Bauchi state. Working with INEC afforded me the opportunity of mixing up with Hausa people, I ate their foods, drank their water and even though I couldn’t really understand their language because I grew up in the south-west region of Nigeria, we got along well. INEC paid us well and we were all smiling to the bank. This encouraged a lot of corpers to develop interest in organizing the election, which is working as a polling officer. But this time, the game changed; there was an abrupt change of mood. Some days to the general elections, I was taking a walk beside a mosque at Kafin Madaki, Ganjuwa local government area where I had my place of primary assignment in the company of my girlfriend and her Hausa friend from Gombe state who was a fresh corper. Then there was a prayer meeting going on at the mosque and a man was virtually addressing the worshippers in Hausa language. It should be noted that in the north, maybe particularly among the rugged people, the mosque is the most effective place for information dissemination. As we walked pass the mosque, I observed the girl from Gombe state who understands Hausa excellently started showing curiosity about the message being passed across. In no time, her countenance changed obviously. I didn’t really bother about her change of attitude but my girlfriend insisted on enquiring about the cause of her change of mood. After much persuasion, she revealed the speaker was relaying a message from Muhammadu Buhari who was then the presidential flag-bearer of the Congress for Progressive Change political party (CPC), telling them to cast their votes and then stand by to ‘defend‘ it. That word ‘defend‘ if carefully weighed is very heavy and powerful. It will unveil itself as the article goes on. I handled it with levity while the girl predicted doom from the tone of the voice of the speaker. She pleaded with us to keep the information secret. To cut the long story short, the general elections kicked off with the National Assembly (Senate & House of Representatives) elections on Saturday, April 9 2011. The presidential election followed on Saturday, April 16 2011. Governorship and State Houses of Assembly elections being the last were scheduled for Tuesday, April 26 2011. The National Assembly election was very much peaceful with candidates from the People’s Democratic Party (PDP) showing an upper hand. This wasn’t done with much seriousness, a lot of voters couldn’t cast their votes correctly at the Kariya station where I worked, the number of invalid votes were almost more than the valid ones. Just a few women turned out to vote. In short, success was massively recorded at all the polling stations. We all returned to our various houses recounting funny experiences and challenges encountered at the polling centres. Meanwhile, there were series of heated debates and incidences of character assassination on the part of President Goodluck Jonathan and Muhammadu Buhari in the news. Gradually the normal jovial environment we found ourselves started becoming hostile. We all know Hausas to be very jovial and accommodating. Personally, I started having serious bad dreams about dead people at the local government. It was too glaring something bad was imminent. I called my family members in Ibadan and they kept praying for me fervently. Rumours of evil plans started emanating from several angles which is normal as long as important events are concerned. A day to the election, an INEC truck was brought to convey all corpers and their indigenous partners to their various election stations. I joined the one going to my station after giving my close friend and room-mate then a very tight hug, we both encouraged each other because the fear was obvious. Sincerely, I started developing this premonition that I wasn’t going to return. At the polling station, the mood changed, all the people came out en masse to vote, in fact some Fulani men left their cows in the bush to vote, in no time I saw a long list of women behind me, well separated from the men which is how it works in the north. A civil servant who was probably well educated through the quality of his spoken English, from the Kariya local government approached me to lodge a complaint about the high number of invalid votes recorded at the National Assembly election which I couldn’t change. To curb a re-occurrence, he decided to inspect the voting for the purpose of preventing mistakes. This depicts the intensity of that day’s election. Conclusively, it meant so much to them. I quickly instructed the policeman attached to my unit to give a short tutorial speech to the voters on the proper way to make thumb prints which he did to the delight of everybody. It was indeed a different day; the voting deadline had to be extended to accommodate the large number of voters who kept pouring out from different locations. At the end of the day, it was almost impossible to find a vote going to President Goodluck Jonathan. It was all a Buhari show with the electorates chanting ‘sai! cpc sai!! Buhari, sai Baba!! !’ I returned to the collation centre where I presented my documented election results. That night, all the INEC workers got into the truck and we hit the road to our local government. On our way to the Ganjuwa LGA INEC office, we learned there was crisis; a large group of indigenes came out with cutlasses, knives, large woods and other weapons to show their ‘support’ for Buhari. A group of soldiers were called to salvage the situation but these daring people remained unshaken to the amazement of everybody. The soldiers ended up keeping a low-profile. As we dropped our bags at the INEC office, these youths surrounded our truck with these scary weapons chanting the praises of Buhari. As a survival technique, we all joined and started chanting simultaneously after them as we jumped out of the truck with our hearts in our mouths. That very night, most of our ladies/female corpers where physically and sexually harassed. Right behind me, a lady was screaming for help after she had her breasts being strongly grabbed, I tried turning back to assist but when I saw some elderly corpers that I look up to for protection running, I realized it was a stupid idea, so I increased my running speed for safety. At the corpers’ lodge, we couldn’t sleep that night out of the fear of an imminent attack, we stayed so vigilant. We were wondering what went wrong until we had on radio the next morning that Muhammadu Buhari accused the People’s Democratic Party of using corpers to rig elections. Our CLO got an urgent call from corpers at Azare LGA, telling us to flee. They claimed they were attacked that night and had to pass the night at a nearby bush. This was very disturbing; I had just #400 on me. We were waiting for the payment of our ‘allowee’ from the government. Some corpers traveled to the town in Bauchi to withdraw money from the bank but most were unsuccessful. Crisis had already broken out; it was an all-out war against Christians and corpers. A corper returned from the town in tears, a male adult for that matter, he was badly bruised, he cried bitterly as he recounted his experience. During this ordeal, we started receiving pictures of our dead colleagues. It was like a horror movie I never wanted to watch. 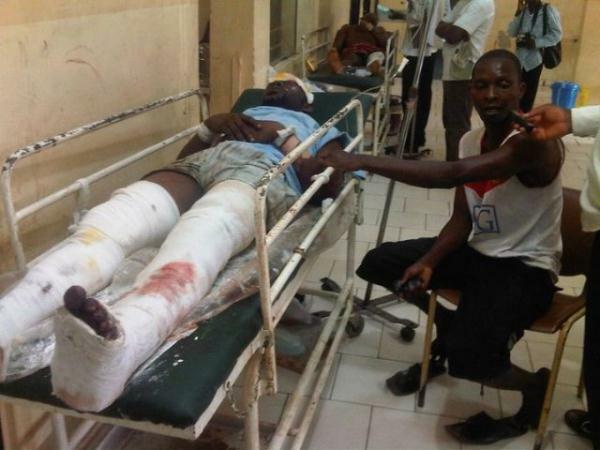 Giade LGA which was just 4hrs away from Kafin Madaki by road was attacked and 7 corpers were gruesomely murdered. I lost my camp friend Obinna Okpokiri, a graduate of Electrical Engineering from Abia State University. I am not sure I can ever forget his face. He was so handsome, tall, fresh and huge. We used to exchange ideas about rap music then. I was told by a survivor who works in Lagos today that Obinna and others ran to a nearby police station to seek for protection when they were given a hot chase but that couldn’t help as the angry mob set the police station on fire and fished them out. They tried running but they caught up with some of them and gruesomely murdered them with cutlasses, woods and stones on the spot. That’s cruel. Just because of one man’s careless statement or accusation. I contemplated traveling to Ibadan but nowhere seemed safe, there were series of killings in the surrounding states like Gombe, Kano, Kaduna and in the city of Jos a marcopolo vehicle filled to the brim with travellers was burnt down and all the passengers killed. It was a close shave, no place to go. In summary, we were moved to a nearby military barrack close to Ganjuwa local government for protection. Life was safer but harder at the military barracks; the traders there took advantage of the situation to inflate the prices of commodities immediately. How could someone reasonably survive on #400 till God knows when? Luckily for me, my girlfriend had extra cash on her, so she borrowed me a sum of #2000 which I used for my upkeep as well as that of a dear friend who was with me. At the barracks, we heard news of more deaths; a lot of us had gory, blood-stained, lifeless body pictures of our colleagues on our phone. The pain couldn’t be explained, at the barracks I became homeless, and there was no decent place to lay my head. I slept at a church with about hundreds of other corpers and Ibo traders who were also displaced by the angry mob at their various locations. There was no sound sleep, my family and friends kept making minute by minute calls to ascertain if I was alive. On the day President Jonathan was declared the winner of the 2011 presidential election, we all gathered at strategic positions at the mammy market over there close to television sets hoping that Muhammadu Buhari will appeal to his people to stop the onslaught on the lives of innocent corpers only for him to reaffirm his claim. Our woes were compounded. For the first time in my life, I felt the painful plight/fate of animals that live with the fear of being hunted for. To cut the long story short, the Federal Government in conjunction with the Bauchi state Government took some concrete relief steps that were so effective and I rejoined my family in Ibadan safely. It was almost unbelievable. I recorded a song at a music studio and dedicated it to the slain heroes. On the whole, we lost over 15 corpers, the leaders of tomorrow died cheaply for no reason. I feel for their parents who were close to reaping the fruits of their labour. Here is the download link to the song, click here.You can listen to it go get a clearer image of the picture I am painting. It’s been 4 years now and I have forgiven the people of Bauchi state, that was what Governor Adams Oshiomohle admonished we Edo corpers to do when we met him in Edo state where he welcomed us. I have forgiven Buhari sincerely. Writing this brings back some very painful memories, I wrote this in deep dears. Funny enough I have decided to cast my vote for Buhari if he is going to be our messiah in Nigeria because we indeed need a change. Thanks for reading thus far and please take a moment to pray for the lost souls and their families. God bless. You can contact me on nigeriana.org through the comment section. Senior Online Editor, Jetheights Services Limited.